A: "Going into the expedition I had the mindset of "no matter how hard it is- just do it." While we were trekking I found myself thinking about the pain and about the arduous nature of the hikes somewhat frequently. I had to catch myself, mid thought, and tell myself "it's okay to not feel well, your body is fighting against the elements, just endure as long as possible." Another main thought that I tried to keep up front and center at all times was "I am part of a team, and as a team member it is my responsibility to maintain myself not only physically, but mentally." At that point I was focusing on recognizing that it wasn't about me- it was about the team and that greatly helped me push myself farther than I ever thought I could accomplish. It also helped me tremendously to keep a positive outlook on everything that happened. Like when the pain was great I would tell myself that I wasn't going to let my body tell me where to stop- I was going to decide when and where that occurred. Thank you so much for your question! The Baffin Island expedition was meant to raise awareness regarding the history of the island and more specifically the Akshayuk Pass (which is the route we traveled), the culture and history of the Inuit, how climate change is affecting the arctic, food sources in the region, Polar Bears, and a few other topics that were covered in the education modules during our journey. 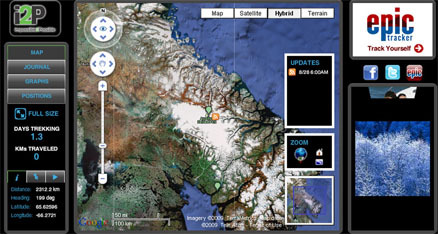 All of the education modules can be found at the following link: http://impossible2possible.com/world/?s=education We also wanted you to follow the journey of our Youth Ambassadors as they pushed beyond their physical and mental limits during this challenging trek through the Arctic. I am also really happy that you mentioned water initiatives!!!! Water was not the focus of The Baffin Island expedition but it will be at the center of our efforts in 2010! i2P is challenging students in Canada and students in the USA to not only raise awareness but also raise funding for specific clean drinking water projects in Africa. Students in Canada will be working with the Ryan�s Well Foundation and students in the USA will be working with GivingWater.org. We are putting together final details so make sure you stay tuned to the website for more information. We hope you and your fellow classmates at The Study will join us in our effort to complete the water projects. You are very right. Medical resources in remote places are very limited. I have spent almost 20 years working as a physician in the Canadian Arctic and have found myself in worrisome situations in remote places with limited resources. Often this results in urgent medical evacuation of people from the remote place by air. Air medevacs in remote places, particularly in bad weather can be very challenging. Certainly young people could be very helpful in a medical emergency that might occur in the Akshayuk Pass. An emergency in the Pass would frequently entail hypothermia (extreme body cold), or a fracture from a fall. In these situations the assistance of all team members - including young people is important, particularly to keep the injured or sick person calm, build a fire, getting blankets or warm dry clothing, making sure the patient has enough fluid to drink or other such activities. Certainly being prepared and having first aid knowledge (a first aid course) would help. I hope this answers your question. Ray and Bob’s Wrap-Up Baffin Island Blog: First off, we would like to thank our families, friends, sponsors, volunteers, and supporters for helping us in our goal to once again achieve the impossible! The Baffin Island youth expedition was a complete success and our youth ambassadors (Amanda, Thomsen, Sandi, Tamara, and Kathleen) exceeded all expectations. In a short period of time the team became a cohesive unit and quickly rallied around each other during an incredibly difficult expedition. The terrain through the Akshayuk Pass is some of the most difficult on the planet and day after day the team put their heads down and pushed forward. They overcame doubts, fears, exhaustion, and inclement weather to exceed their mental and physical limits! They truly show that we are all capable of achieving extraordinary things! This expedition wasn’t just about an arduous journey this was also about celebrating the north and we were all truly captivated by the magical scenery that was on display in one of the most amazing and beautiful places on the planet. Tamara: "Yesterday we finished the pass!! It felt so great to finally be done! It was beyond satisfactory! The youth ambassadors lead the way to the end of the pass and we finished strong as a team. While on this journey we have all learned so much about each other and about ourselves. It has been life changing no doubt. Although, our expedition is not nearly done. Sandi and I woke up today with a pool of water in our tent. The winds were extremely strong. It wasn't a beautiful sight to wake up too. We are so glad we have completed the pass- we are now waiting for the boat to take us to Pangnirtung as the weather has made the 2 day walk to town a very hazardous and dangerous trek. So our adventure is not done yet! We will be in Pangnirtung until the 16th. We are looking forward to more questions from the schools, as we loving receiving and responding to them! So keep them coming!" Amanda: "How amazing today was! We finished the pass at 100km and I know I am so proud of myself and my team. The terrain was gorgeous and we were even treated to a huge rockslide during last night. We are out on the ocean now and the tide has just rolled in- we have been noticing quite a few arctic hares lately- they are so much bigger than the small rabbits in Cali! I just want to send my love to me family and friends in SoCal and I want to tell Marcus I love you and that without you this would not have been possible for me; I can't wait to see you and tell you all about my adventure! With love from the North, Manda"
Ray: "Hey Everybody ! Just a quick email to let you in on the awesome news ! We have completed a successful crossing of the Akshayuk Pass on Baffin Island in our goal time ! We arrived in South Pang Fjord this afternoon to cheers from our Youth Ambassador Team ! We will continue to blog and answer student questions (sorry for some of the technical difficulties- Anton has been working overtime to make things work- Nick is on his honeymoon and unable to do his usual web "magic"...) The help of awesome companies such as First Air, Gatorade, Iridium and Canada Goose made this expedition possible- please check our sponsor page for more. As soon as we get home we will be posting many of the exceptional media attention these young adventurers have accrued in our Press section. Check there soon. So- the adventure continues- keep watching for photos here, blogs from the Youth Ambassadors- and we will start posting from Pangnirtung (and our potential trek to there !) Cheers Ray"
Sandi: "Today we finished the pass! The 5 ambassadors all did the final bit walking and getting stuck in the mud together. Theres no other 4 people i would rather do it with. These people were all amazing before we started, but we have all been talking about what we want to do after we get back and everyone wants to do some amazing even more amazing things- things we wouldn't have thought possible before we started. Not everyone is meant to do expeditions but we all have the capability of doing great things, just find what your passionate about and go for it! Sandi !" The issues with the links in the modules have been resolved. What does a Baffin Trekker carry in their backpack for a multi-day trek across the Akshayuk Pass? Please explore the map below which locates the 30-plus schools and over 5,000 students participating in the Baffin Island Expedition. impossible2Possible is the perfect compliment to 21st Century learning. Via i2P, my students become involved paticipants in their adventures, and learn about the environment and people around the world. This is out-of-the-box learning at its best. I can't wait to show my students the Baffin Island expedition. When they find that they can be involved following Ray and the i2P team in an interactive learning process about the environment and peoples of the world, there will no stopping them! The i2P World Expedition: Baffin Island is proud to announce that Green Nexxus will be offsetting all of our flights. Learn ways by which you can Green Your Life now.